As a marshal and a soldier, Ian’s expected to lead. But the power and control that brings Ian success and fulfillment in the field isn't working anywhere else. Ian’s always resisted all kinds of tied down, but having no home—and no one to come home to—is slowly eating him up inside. Over time, Ian has grudgingly accepted that going anywhere without his partner simply doesn't work. Now Miro just has to convince him that getting tangled up in heartstrings isn't being tied down at all. I just recently discovered your work. If this is anything like your Matter of Time series I know it will be a great read. Thank you Christina, I hope you enjoy it. I love that cover! 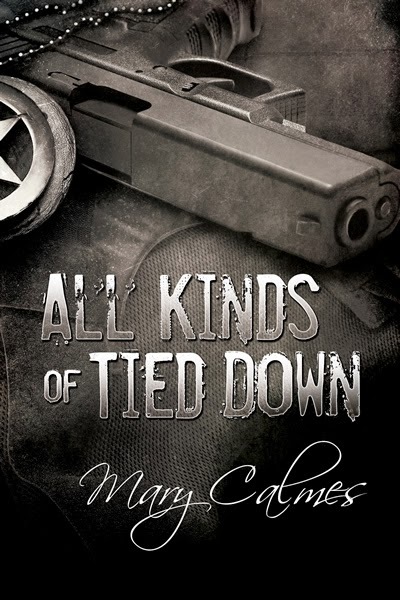 And yay for a new Mary Calmes book, can't wait! I know how I'm spending my holiday! Thank you Kris, I love the cover too. Reese Dante is a genius! She did everything I asked. You have to let me know what you think after you read it. Ooh! I'm so excited. Major happy dance. I can't wait! This will make for an awesome 4th. Sounds great (but all your books are)! :) I know what I'll be reading July 4th. Yeah, that cover is beautiful, but kind of reminds me of Captain America lol. So excited to read this. Hey Mary, Huge fan of your work. My favorite book (right now) is Mine with Trev and Landry. Was wondering if you would write a followup to their story. Would love to catch up with them. That is a lovely cover, Mary! The description makes the novel sound interesting as well. The cover will definitely help sell your novel. Will these characters have another story to tell after this one? Hi there - just wanted to gush a bit and thank you for writing what you have and putting it out there. Your books have stuck with me long after I've read the last page (was introduced to you with Steamroller which is a frequent re-read - practically memorized by now), and both Acrobat and Frog, as well as the Timing series - particular all-time favorites - are very near and dear to my heart. Your characters touch me deeply - so I wish you much joy in your writing and hope it continues for a long, long time!